Herminso Villarraga-Gomez (Nikon Metrology, inc.) in collaboration with the National Institute of Standards and Technology (NIST) has recently written and published a paper addressing the viability of X-ray CT for inspecting additive manufactured components. Here you can read or download the paper to take a closer look at the experiment and understand the findings. 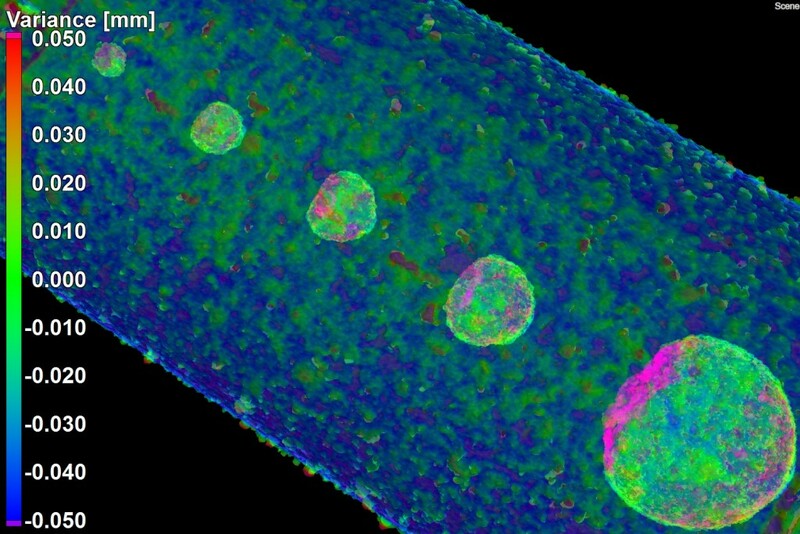 Color map of deviations from CAD model for a Nickel-based AM specimen designed with interior spherical pores incorporating different sizes. Color map for the part-to-CAD comparison of a Nickel-based AM part with interior spherical pores. The right side shows the internal structure of the larger pore which has 2 mm nominal diameter. Additive Manufacturing continues to threaten to be the next big thing in manufacturing industries. The only hindrance is the ability to gain a reliable and comprehensive non-destructive insight into the complex internal shapes and features of the additive manufactured components. 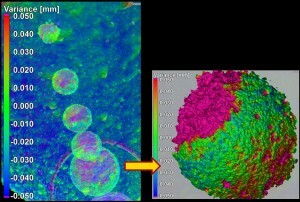 Using the Nikon XT H 225 ST, Herminso and the team at NIST have conducted an experiment to research the viability of X-ray and CT in the characterization and evaluation of defects and flaws in metal additive manufactured parts. This study presents the findings from an experiment where X-ray and CT is applied to three samples, each differing in their internal features and dimensions with embedded defects. The resulting scans are displayed in a CAD comparison to analyse the quality of features, porosity and pore size. The findings and evaluation of X-ray and CT for the inspection of AM parts are presented in the paper which you can read here. For a brief overview of the paper, you can read the short abstract here.